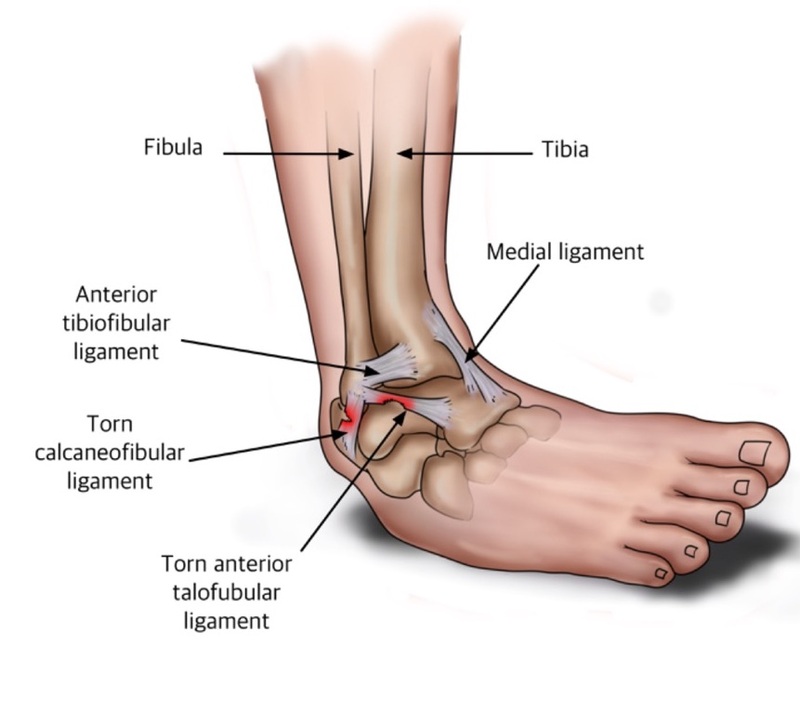 LIGAMENT injuries to the ankle are very common. The ligaments connect bones together. 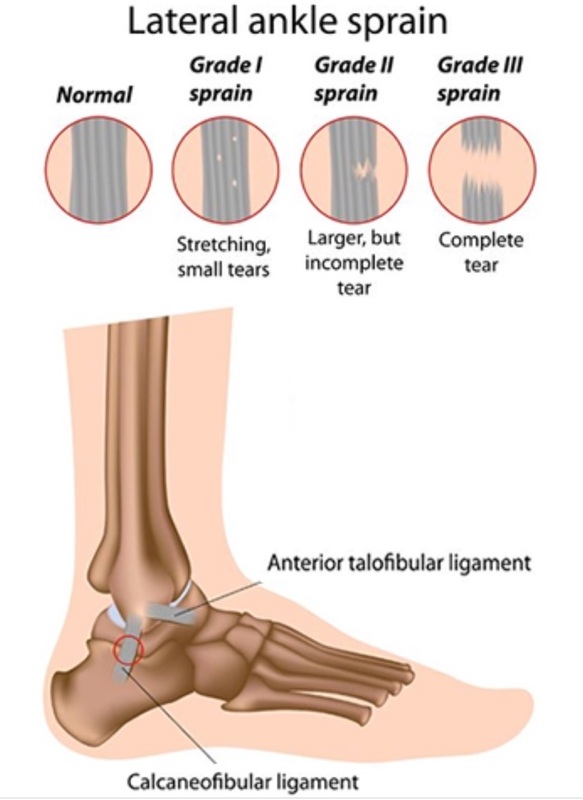 When the ligament stretches beyond its elastic limit, partial or complete tears develop. 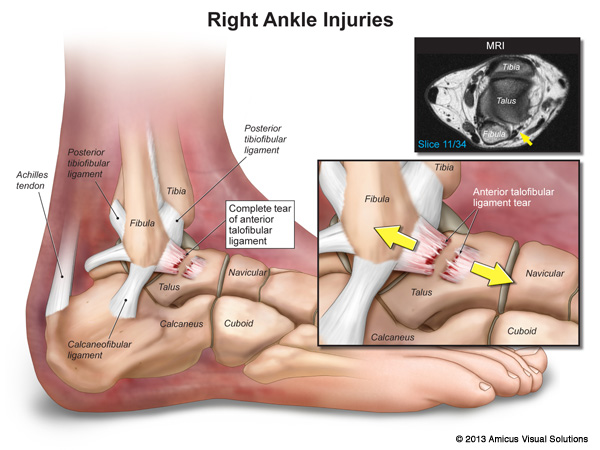 The most common ligament injury in the ankle is due to a twisting injury of the foot down and in. This can occur from sports, twisting the foot under the leg in a hole or even falling off of a shoe. A thorough evaluation will best determine the injured part and the extent of the injury. With the increased participation in sports at a very young age the frequency of ankle ligament injuries has been rising. • Low-grade to diffuse swelling present along the front and outer part of the ankle. • Swelling may also be present on the inner ankle in severe outer ankle sprains. It may also be present with an inner ankle sprain where the foot turns down and in. • Discoloration to the ankle and foot may develop a few days later. • Immediate evaluation is necessary to determine the extent of injury. The foot, ankle and leg are examined to determine which ligament is injured and the degree of injury associated with it. 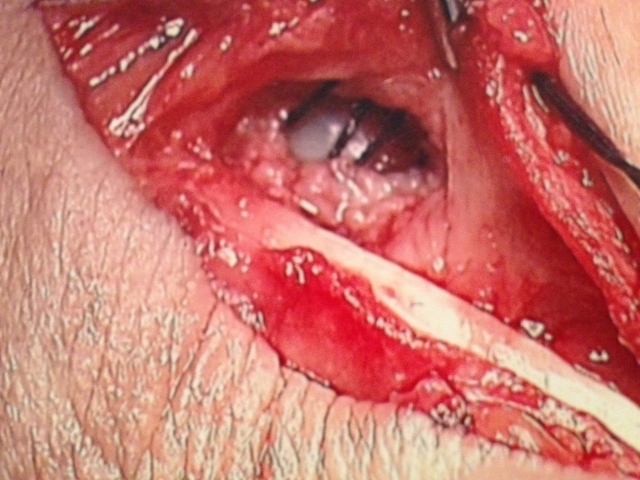 Testing of the ligament’s integrity is also performed to further assess the damage. 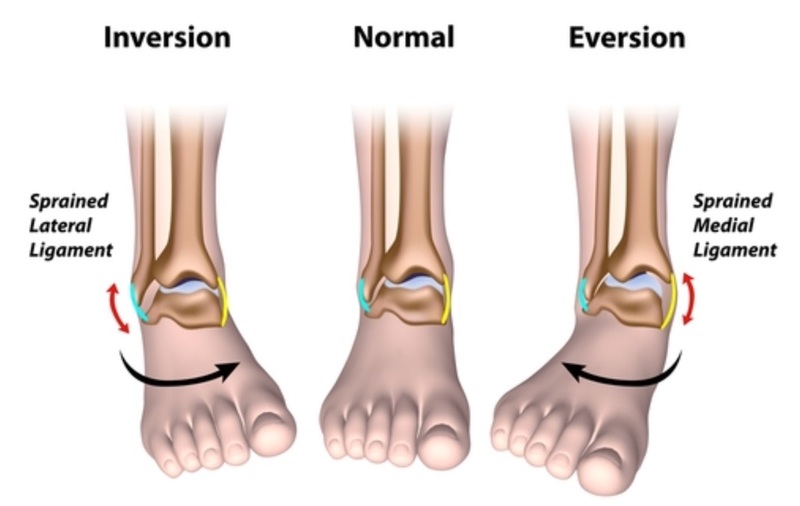 • Examination of the tendons and bones around the ankle is also performed to determine any associated injuries. X-rays are necessary to determine if there are any associated bone injuries. Growth plates are evaluated to see if they are out of position. MRIs are rarely necessary as a good clinical exam usually provides all the necessary information in formulating a diagnosis and treatment plan. An MRI is done only if there is suspicion of a cartilage injury that cannot be assessed via a clinical examination or x-ray. A CT Scan might be necessary if the bone is fractured. These scans give us a complete evaluation of the bones and check their alignment relative to each other. • Immediate care is necessary to prevent any long-term problems. • Mild injuries associated with minimal swelling may be treated with rest, ice, elevation and an ankle brace. • Moderate injuries in which a partial tear has occurred may necessitate immobilization for 2-6 weeks in a removable boot or hard cast. • Severe injuries need to be immobilized in a hard fiberglass cast for 4-6 weeks to allow the ligaments to heal properly. Weight bearing is usually allowed. • Anti-inflammatories such as advil, ibuprofen, aleve, motrin or naprosyn should ALWAYS BE AVOIDED. Ligaments heal with scarring and these medications lessen inflammation which reduces scarring. This is NOT a good thing to do. • Physical therapy following bracing or cast removal is necessary to improve muscle strength, ankle stability, joint proprioception and to restore complete ankle range of motion. If left untreated, chronic instability commonly develops. Recurring twisting injuries then occur with minimal stress. This will require chronic use of an ankle brace and physical therapy. Prolotherapy can sometimes be performed to cause inflammation in an attempt to restore or increase stability. This is a series of weekly injections into the ankle ligaments, ultrasound guided with an irritant solution of Dextrose and Lidocaine (sugar water). Platelet Rich Plasma (PRP) injections may provide a stimulus to healing If there is chronic instability, surgery would be necessary to surgically reconstruct the ligaments in the ankle and allow a full return to activity. In such cases, the prognosis is excellent. Below is an MRI of the ankle demonstrating injury to the Anterior Talo-Fibular ligament which is the area of bright white at the top of the picture which is significant swelling. 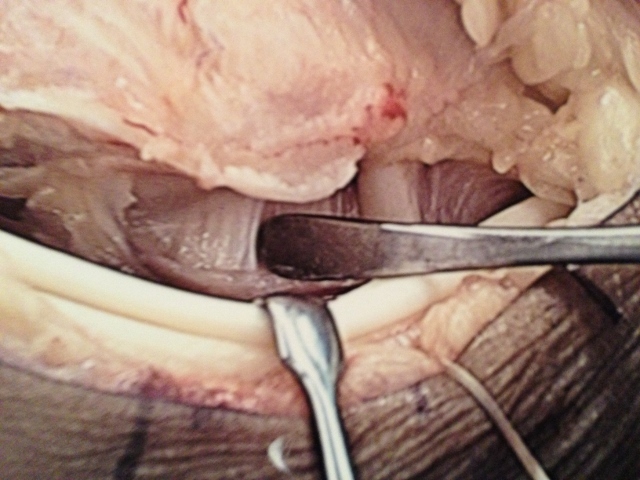 This is a picture of the CFL being repaired with suture during peroneal tendon repair. 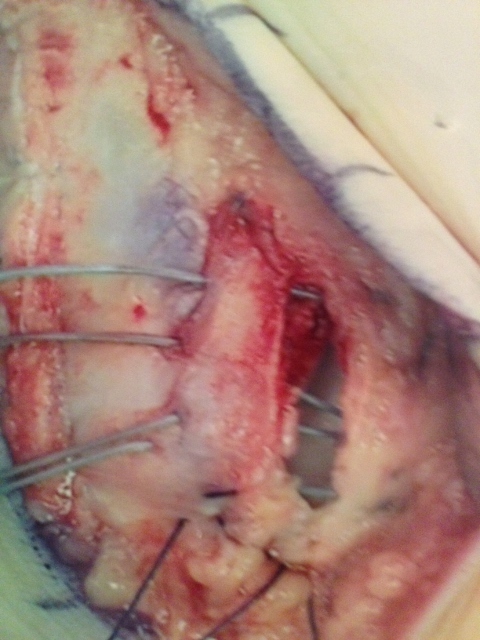 Repair of ATFL for chronic ankle instabiity. 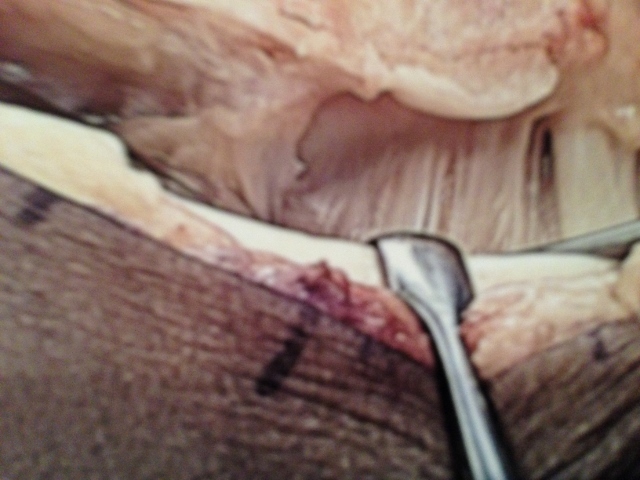 Pic of CFL behind the peroneal tendons.